When Travis told the rest of us at Ninthlink that when he was going to visit his family in Montana for Christmans vacation, he wouldn’t be coming back to sunny San Diego, we were sad to lose his physical presence, but happy that he can be one of the first supporters of the “V9” idea. 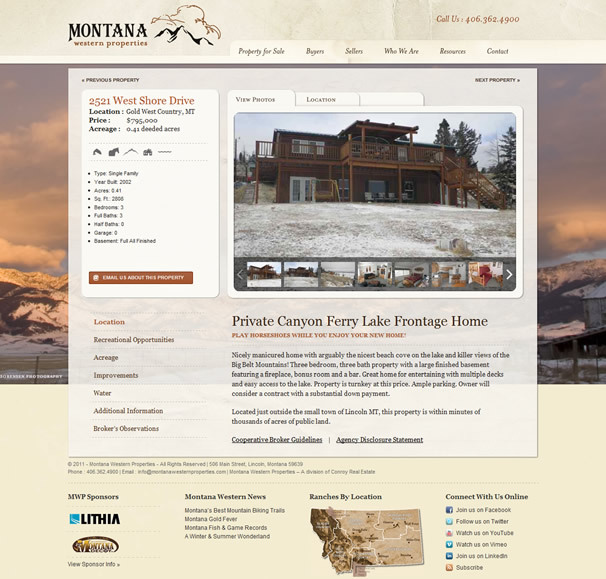 And now, he and I get to present what just might be Ninthlink’s Montana branch’s first official site launch : MontanaWesternProperties.com. The site currently highlights some 12 properties in Montana’s Gold West Country, with plenty of room to grow in to the rest of the state. By using WordPress’s Custom Post Types, the client has full administrative control of all aspects of the site. The always-wonderful NextGen Gallery helps showcase the properties, as well as provide the rotating backgrounds on the homepage. Featured Vimeo videos can even be included on a second tab, if one is available for that property. And a third tab pulls in the Google Map location, all on the same page. What I am especially proud of is the Properties / Real Estate management system, via the “CPT” (custom post type). Using the WYSIWYG for the main content, custom taxonomies to identify the Location, and key Recreational Features there, the “Featured Image” post thumbnail, and a custom meta box for all the rest of the Property Info, every bit of info for a given Listing is managed on one place. Furthermore, Listings are automatically grouped upon Saving, so if you happen to be interested in, say, a Residential property, under $1mil, with Fishing and the opportunity for some Big Game Hunting, you can Filter the Listings to do just that. What won’t they think of next? Noice. This is looking good!